Three days of sun, sea and sailing. What more could you want? Some rather nice people to sail against would help and we had those in abundance at the 2018 Harken D-Zero Nationals hosted by the Mount Batten Centre and Plymouth Youth Sailing. To be honest, other than the sun, the forecast wasn’t looking great for the weekend with light to non-existent breezes predicted for all three days. A light northerly gradient breeze and soaring temperatures on day 1 augured well for a potential sea breeze though and it delivered in spades, kicking in at close to 15 knots, rock steady from the south. Race 1 and with the tide just starting to ebb the choice up the beats was to go left, left, left or the other way. Pre-tournament favourite, Ian Morgan (Netley), led at the first mark from youth prodigy Charlie Ellse (Restronguet), having judged the layline to perfection. These two pulled out an embarrassingly large lead as the race progressed but it was looking like a Cornish benefit with Portpean and Restronguet boats closing out the top 5 – Stacey Bray, Darren Williams and Hugo Helene respectively. For race 2, having decided that, after all, right was not the way to go up the beats, Steve Bolland (Bristol Corinthian) took the pin end of the line, hit the port layline and led at the first mark and for the remainder of the race. Morgan took another useful 2nd ahead of Williams, new boy Alistair ‘Storky’ McLauglin (Prestwick) who had only bought his boat the week before, and Bray. The Cornish contingent was once again all over race 3 like a rash, filling 4 of the top 5 places at the first mark and 3 of the top 5 at the finish. What do they put in those pasties? Although Ellse and Morgan led initially they did not pull out as they had in race 1. Bolland picked up a nice lift (on the left inevitably) on the final beat to edge in to the lead but could not hold off his attackers downwind and the finishing order was Ellse, Morgan, Bolland, Bray and Williams. Overnight, Morgan and Ellse had built up a nice lead over Williams, Bray and Bolland but with a lot of sailing still to come. Day 2 was again hotter than expected but with no gradient wind it was debatable whether the sea breeze would kick in in time for the late morning start. It did, but never really rose above 10 knots. 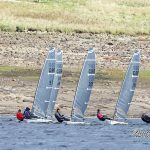 Race 4 was taken by Jon Aston (Grafham Water) via the unusual tactic of going up the middle of the beat and sailing the shifts. Bolland was 2nd at the first mark but dropped down to 5th. If the boy could sail downwind he’d be half useful. Ellie Craig was starting to show form and Storky and Bray both also had countable results. With overnight leaders Morgan and Ellse both having relative shockers the championship was wide open again at the half way stage. 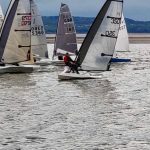 For the third and fourth races in a row, Bolland and Storky claimed the pin end of the startline in races 5 and 6, even managing to stay out of each other’s way, mostly. This was becoming a habit, and a good one, as they recorded 1, 3 in race 5 and 1, 2 in the final race of the day. Having a one-way race track involving minimum thought was clearly playing to their strengths. Also going well and moving up the leaderboard were Jon Ashton, going extremely well in the lighter airs, James Edmund (Queen Mary), Tim Weeden (Emsworth Slipper) with Bray and Craig also putting in another couple of bankable results. With one day to go the overnight leaderboard was somewhat different from the previous day, Bolland now holding a useful lead over Storky and Morgan with Bray, Williams and Ellse not too far behind. The final day started off blisteringly hot and didn’t relent. Were we on the continent or something? However, with no gradient wind once again the sea breeze was slow in appearing. Would the hour’s postponement allow the breeze to fill in or would we all be heading for an early shower? Bolland was hoping for the latter but a fitful southerly began to build and we were sent out for the final two races. Inevitably, Bolland and Storky claimed the pin end, or thereabouts, and were off like scalded cats up the left hand side of the beat. Both in the top few at the first mark they were smiling like Cheshire cats who hadn’t been scalded at all. By the bottom mark Ellse and Craig had established a slim lead but Bolland and Storky flew up the final beat to be 1, 2. However, once again Bolland showed his frailities downwind, dropping to 3rd with Storky taking the win from Craig. However, despite having done just enough to take the championship with a race to spare, Bolland sportingly stayed out for the final race, keeping the fleet amused by capsizing on the first run for which he earned ‘Deck of the Day’. It sounded like that anyway. Thanks for the nomination, it will be an award I’ll treasure always. I had to take a short cut to see what was happening at the front but Ellse was using his athletic frame to good effect in the marginally stronger breeze, winning from Storky, Richard Major (Grafham), Craig and Edmund. Packing up was a relaxed affair in the late June sunshine with much chat about the quality of the racing and next year’s champs at the Weymouth & Portland National Sailing Academy. Many thanks to title sponsor Harken, distributing an array of hardware to all in the fleet, Devoti Sailing and dzero.co.uk. Your support is valued. Also many thanks to the Mount Batten Centre, Plymouth Youth Sailing and the excellent race officering of Keith Kendall and his team. Next up is the Clevedon open meeting on 7th July. 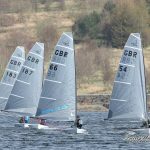 For those who were not there, or those who were and want to see where they got things right (or horribly wrong) the race tracks are posted on the Sail Racer website, click here to see them. Thanks to Simon and Claire from SailRacer who did a great job over the weekend with the tracking of the event and posting updates on social media during the the racing. Thanks to the generosity of our title sponsor Harken no one went away empty handed with a choice of bottles, bottles openers, sunglasses and stickers for every competitor. 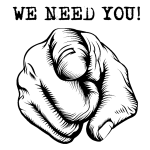 Thanks also to our hosts, Plymouth Youth Sailing and the venue Mount batten Watersports and Activities Centre for host ‘the best nationals yet’. Finally Martin Latimer generously provided incumbent class chair Paul Jefferies with a bottle of whisky on behalf the the members of the Class Association for his hard work and for choosing to stay on as Class Chair. 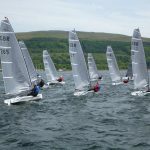 The 2019 D-Zero Nationals are being held at Weymouth and Portland National Sailing Academy on the 21st-23rd June. this is the 5th anniversary for the class and preparations are already underway to make it the best nationals so far.